When I was a teenager, “I had all the answers”. Then when I was in college “I knew everything”. I graduated and “I knew all there was to know”. When I got married I made sure my husband knew “I had all the answers”. But then when I became a parent and I had my first child, I did not have all the answers. I had hardly any of the answers. Have you ever been in a situation where you felt totally at a loss? Aren’t we parents supposed to know everything there is to know? We’re supposed to have all the answers? But as they say, we don’t get a manual when we have our first child. Sure I could solve most of the everyday problems, like putting a band-aid on a cut. But I wasn’t prepared for the day that my daughter came home from second grade and told me something that shook my view of myself, as a parent and my career as a teacher. I was definitely in the position of not knowing the answers that day, the day my sweet, innocent 2nd grade daughter looked into my eyes and told me that I had failed as a parent and as a teacher. She didn’t say it in those words, but that’s how I felt when she told me that she had failed the 2nd grade reading assessment test. I remember how shocked and confused and inadequate I felt that day. I thought, “But I’m an excellent parent and a teacher. How could this have happened and how could I have failed so horribly?” My whole identity was crushed. So the first day I had all the kids sitting down in my living room, the smell of popcorn was in the air. We had a snack and we just started playing reading games and having a good time. I noticed as the weeks went on, that they were learning a great deal and they were having fun. I still didn’t know if this was going to solve my problem, if it was going to give me the results that I was really looking for, but I knew I just needed to keep going at it. Okay, now imagine how I felt six months later when I was talking with my daughter’s teacher and she informed me that my daughter was not below grade level now but in fact had gone two grade levels above. All my fear and stress just melted away and my confidence was back. I had found the answers, maybe not all the answers to life’s problems, but I had solved this one. The reading class had been so successful that I added more and more students until there were too many to fit in my home. We then moved to a local community center, where the classes have been running for over 10 years. To this day, they continue to have large waitlists of children trying to get into the program. I have added additional locations, but wanted to reach more children than just those in my immediate geographic location. I decided to write, What Children Need to Learn to READ – the complete parent’s guide to ensuring literacy, a love of reading, and school readiness – Birth through the Early Grades Edition. Within the book I spell out my approach for the first time so that all parents and caregivers can help their children achieve the same success that my daughter and my students have achieved. Learners Lane is a company that offers educational information, products, programs, and services to support families and their children in their quest for learning. Michelle Vallene has a teaching degree with specialties in both reading and English. While raising her three children, she started a successful education business, Learners Lane, beginning with reading classes out of her home. Due to the large demand for the reading programs, the classes were moved out of her home and continue to run at local elementary schools and community centers. 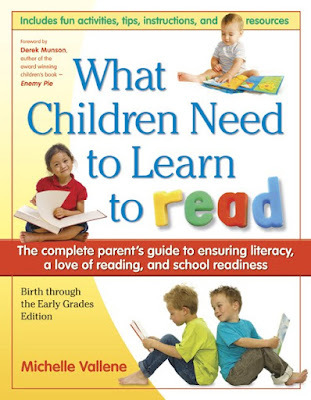 Michelle wrote the recently published book, What Children Need to Learn to READ – The Complete Parent’s Guide to Ensuring Literacy, a Love of Reading, and School Readiness – Birth through the Early Grades Edition. The book has gotten rave reviews and has already helped many families build a strong foundation for reading success. The book is a finalist in the Foreword 2010 Book of the Year Awards in the Parenting Category. Michelle is on the Board of Directors for the Washington State Foundation for Early Learning. She also currently teaches part-time as a reading and math specialist and is a professional speaker. Michelle has also been featured in newspapers, on websites, and on many radio shows around the country and in Canada. Thanks! BUY IT: You can buy this book here for just $14.95! 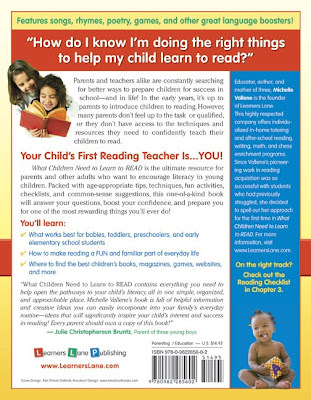 WIN IT: One (1) winner will receive a Book and Audio CD --- “What Children Need to Learn to READ – the complete parent’s guide to ensuring literacy, a love of reading, and school readiness – birth through the early grades edition” by Michelle Vallene. (Value: $25.00 USD)* Please leave your entries to the Rafflecopter form below. ** YOU MUST DO THE MANDATORY ENTRY FIRST AT THE TOP OF THE FORM, OR YOU WILL BE DISQUALIFIED! DON'T TWEET WITHOUT DOING THE MANDATORY ENTRY! Learners lane created a program which help children learn to read without making them feel bored..